Thank you everyone who made it out to Essay Fiesta last night. We had a wonderful show, and thanks to you all, we broke our previous fundraising record. We’d like to once again thank all our readers: William Shunn, Jim Pickett, Cameron Esposito, Rebecca Rine-Stone and Bryan Bowden. For those that didn’t get a chance to purchase Cameron’s new comedy album, Grab Them Aghast, you can find the CD on iTunes or Amazon. We’d also like to thank the Book Cellar for being such gracious hosts, and Randy Richardson for donating the Cubs tickets. We’ll be announcing the May line-up soon, so stay tuned. 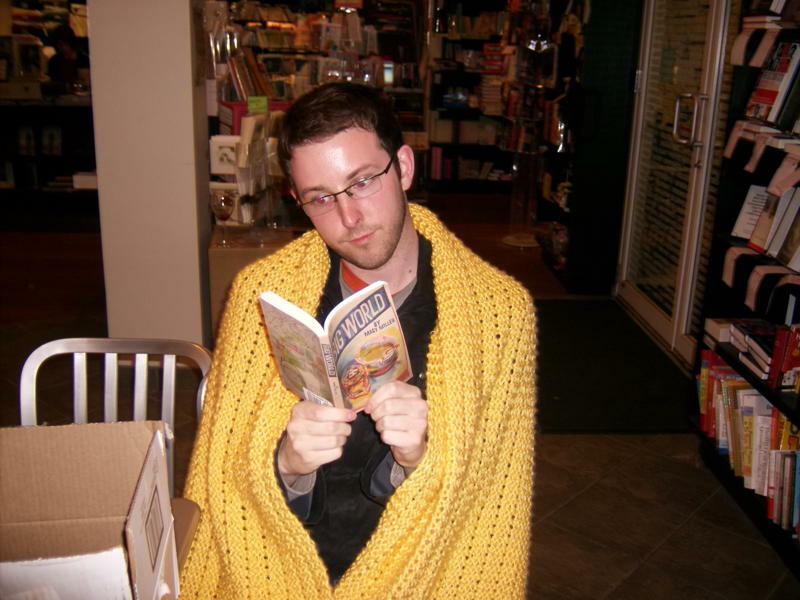 In the meantime, befriend us on Facebook; read the recent press we received; and oggle at this picture of Essay Fiesta prize winner Patrick Butterfield enjoying his new, hand-knit shawl made by Alyson’s aunt Anna Lyon Baker.